PALISADE — First it was hail that pounded the vines in 2009. Then freezing winter weather decimated the next year’s crop. Skip forward to 2013 to a spring freeze that killed some varieties of grapes completely and so damaged entire vines that they had to be cut back to nubs. But Patty Price of Mesa Park Vineyards isn’t discouraged. Her family isn’t ready to give up and return to Denver. Instead, they are in the middle of crushing what they have. 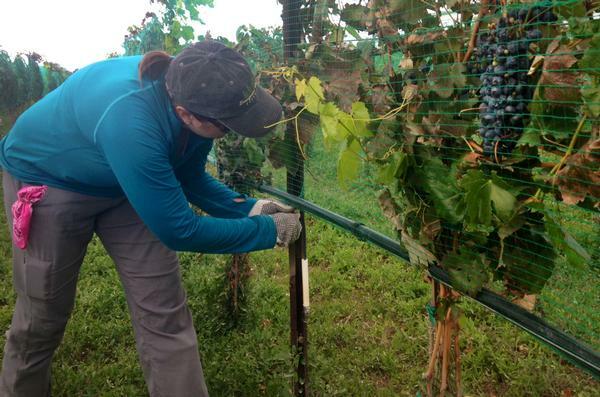 They are retraining some damaged vines and getting creative with blending grape varieties. That spirit is a good thing to have this wine-making season in the heart of Colorado’s wine country in the Grand Valley. An estimated half the grape crop was lost to deep-freeze temperatures in January and unusual thermometer dips in April. Nearly all the Merlot grapes — the valley’s biggest variety — were lost. Gewurztraminer took a giant hit. Tempranillo grapes were decimated. Vines that produced about 1,800 tons of grapes last year are expected to barely eke out 1,000 tons this year. Getting “creative” is a new buzzword heard across Grand Valley vineyards, where there has been a string of rough years. Dr. Horst Caspari, viticulturist at the Colorado State University research center on East Orchard Mesa, talks in more blunt terms. He says change is needed in Colorado’s wine country, where years of cold and frost have weakened some well-established vines. “We can’t keep doing what we’ve been doing,” Caspari said. Caspari is pushing vintners to grow more cold-hearty hybrid grapes rather than the traditional European varieties. That means instead of increasing acreages or replanting Merlot, Cabernet and Chardonnay, there would be some vineyards planted with Marquette, Frontenac and La Crescent grapes — hybrids that have been proven in Minnesota to withstand temperatures that fall far below zero. Linda Brauns of Evergreen prepares to harvest barbera grapes from a vineyard she purchased several years ago and is trying to rehabilitate. Caspari is particularly pushing for those varieties in some of the more low-lying pockets of vineyards in the rolling hills around Palisade. Cold air tends to sink into those areas and, in a phenomenon very visible this year, kill those vines while higher vines in the same row survived with little or no damage. Caspari also is advocating for different vine pruning methods that will create multiple trunks and more fruit-bearing “arms” from those trunks. Parker Carlson of Carlson Vineyards said, in the meantime, getting creative for him means bringing in out-of-state grapes for only the third time in the 26 years he has operated the winery. Even at that, he said he will produce only about 65 percent of normal. Click to read at DenverPost.com.